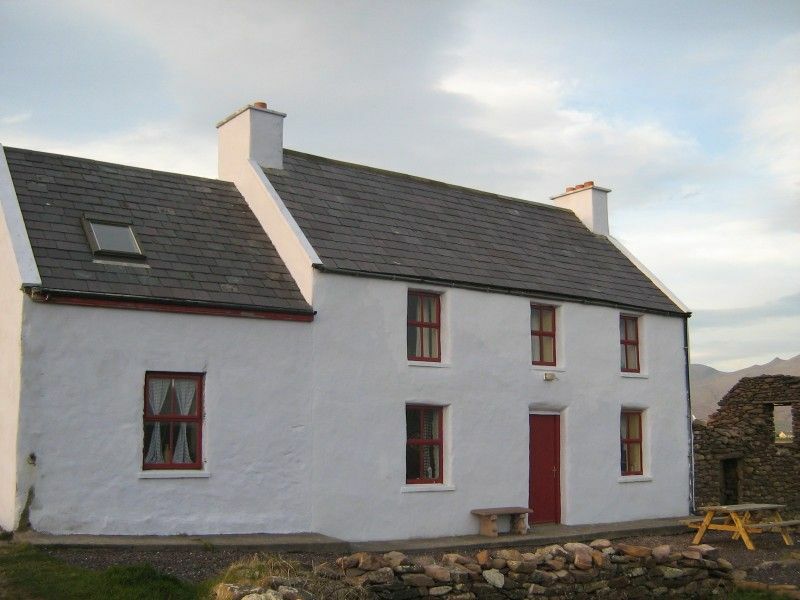 Stunningly situated two-storey holiday house 10 min outside of Dingle town by car going in the direction of mt. Brandon and Ballydavid. Three bedrooms, one with a double bed, one with a bunk bed (two singles) and one with a double bed and single bunk (sleeps 7 total). The beautifully renovated farm house has a large kitchen and living room with a traditional fireplace including the original antique iron crane (see photo). There is a cozy bathroom downstairs with bath/shower and a toilet upstairs as well. The breathtaking view from the front of the house looks directly out on Smerwick Harbour to the south and to the West lie the Three Sisters and the Atlantic horizon. To the east is Ireland's second highest mountain, Mt. Brandon, climbed by Celtic/Christian pilgrims since the early Middle Ages. Also visible in the distance are the hills of Great Blasket Island. Total privacy, a cozy house facing the North Atlantic & proximity to Dingle's lively pub scene are what this house offers. I am originally from County Cork. I grew up in an irish speaking family and we spent our childhood holidays in West Kerry. I fell in love with the area and the cottage is now my family holiday home with my three sons. The area is an inspiration for me as a singer with the area`s rich irish traditional music culture. The cottage is a unique location with total privacy and stunning uninterrupted views of Smerwich Harbour and the Atlantic ocean. Winter or summer, it is a beautiful warm,quiet and peaceful place to be. It is a traditional house maintaining its original character with wooden beams and stone floors. There is a feeling of going back 100 years in time. For me it is the only place in the world where time stands still and one can forget all the stress of work and modern living. The bathroom is tastefully decorated in victorian style with painted wood panelling. There is ample hot water and a very comfortable bath. The heating system is run on an oil-fired boiler which you will find in the utility room by the back door. The boiler will be set on CH/HW and on a timer. Please do not put the setting to constant. It is a condenser model which means that the water tray needs to be emptied. There is also a filter under the water tray which needs to be rinsed out. A lint filter on the door needs cleaning too. There is adequate parking to the rear of the house. Please do not park on the roadway as it will block farmers right of way. A very interesting selection of books on local history, crafts, cooking. Most magical weeks of our lives! We are in our late 60s. My husband & I spent 6 glorious weeks at Young’s Cottage beginning Sep15 - Nov 1 this year. It has taken me a long time to write this review because I was so sad to leave that I simply was not able to put my thoughts into words immediately. The cottage is 1 of the most beautifully, carefully & thoughtfully restored buildings I have ever seen. The integrity of the original cottage combined with creature comforts manifests into a unique & cozy dwelling. A large working kitchen with a magnificent Belling cooktop with multiple ovens is the centerpiece. The sink is under a window that faces the sea & a large cupboard holds beautiful crockery & every kind of food preparation & presentation item you could ever need. Lots of cutting boards, linens & prep tools in drawers. We had so many lovely meals at the big kitchen table with candles burning overhead. The laundry & mud room where practical with plenty of room for boots, jackets, hats and scarves. Also lots of hot water. The sitting room faced the sea & the original fire grate was beautiful & functional. A hot whiskey in front of the fire was often the capstone of a full day of hiking & exploring. The beds were comfy & again, plenty of linens, blankets & pillows. We did not rent a car. We landed at Shannon, took a bus to Birr where we stayed for 2 weeks then took a bus to Dingle & a cab to Young’s Cottage. We walked everywhere & that is how we met so many people & saw so much up close. Info that may be useful to others: bus into Dingle every Tues & Fri at 8:45, can catch by the lavender house down the road; best chowder in Ireland at An Bothar about 2 miles toward Brandon Mt. Maurice & Aileen the owners are wonderful & their son Thomas is the chef; go to TP Tighs about 3 miles in Bally David across the bay, then walk the cliffs on Dingleway to get back to the cottage; to reach the ruins behind & above the cottage walk west along the cliffs in front of the cottage then follow the stone walls straight up the hill, plan about 2 hours for the hike up because the entire route is so beautiful you will want to stop and take it all in; in Dingle breakfast at the Pantry is a delight, the sticky toffee pudding at Random House is yummy, don’t miss the cheese shop on Greys Lane, nail salon Pure Beauty, haircut at Mary Ann’s and music at Nelligans to hear the fantastic Begley family. The views from the house are stunning. Kathleen thank you for sharing your special home. We are already planning our next trip. Charming cottage - fantastic views! We had a great time at Young's Cottage. We traveled through many towns in Ireland, but always felt more at home in Dingle! The local farmers were very friendly and answered all our questions. We loved our stay at Young’s Cottage! The location was amazing very close to the water with stunning views! The peat burning fireplace is a fun experience and really adds to the charm. In our group we had 4 adults and 2 children, it was perhaps a bit tight with that number of people. There is only one shower/bath on the main floor which is something to consider with a larger group. Overall we greatly enjoyed our stay! We were looking for something authentic feeling and got it with Young’s Cottage! Dear Jamie, thank you very much for your review of Youngs cottage. I am very glad you enjoyed your stay. As it is a traditional cottage it is also limited to one bath and yes it is rather "cosy" with 4 adults and 2 children. But I hope it did not cause you too much inconvenience. I also hope that you enjoyed the beautiful weather which is quite rare in this Atlantic coast. The cottage is located on the sea just as it appears in the photos. It was a beautiful setting. The beds were comfortable an we had everything we needed. It was a little hard to find. Your gps may say Ballydavid North, but it is Ballydavid. We figured out if you google the pub in the owner’s directions (An Cuinne) the bus stop nearby comes up (Feohanagh). Use gps to get there then follow the owner’s directions from that point. Dear Kelly, thank you for taking the time to review Youngs cottage and I am so happy to hear that you enjoyed your stay. The place names in Ireland can be crazy and especially regarding the translations of irish place names into english. The pub is absolutely the best place to consult if you get lost or confused. I hope to see you back again in the future and sorry that I dont live nearby to have been able to welcome you myself. My husband and I thoroughly enjoyed our visit! We visited the beautiful Dingle peninsula in May and felt completely at home in this charming vintage cottage. The entire house was lovely and the view was outstanding. We visited Dingle town in the evening and explored the delights of the countryside by day. We spent a gorgeous day on the Blasket island while we were there as well. I would love to visit again! April stay with a great Atlantic storm, 40 to 50 knot winds driving rain against the old wooden framed windows, listening to the pounding waves on the rocks. Perfect time just relaxing with a fire of peat taking us back in time. Dingle, Dingle-Peninsula, Blasket Islands, Mt. Brandon, Gallurus Oratory... the Dingle area is world famous for its Gaelic heritage and beautiful landscapes unlike any other part of Ireland. Perfect for hiking, fishing, snorkelling, bike-riding, sailing, wind-surfing, music, relaxing with a pint of Guinness, etc. This dramatic Atlantic coastal region lies so far west in Ireland's geography that local signs say, 'Next Parish: America'. Electricity and heating costs included in the rental price. Bed linen, bath and kitchen towels are provided. Cleaning fee of 90€ Rental price may vary during official holidays (Christmas, Easter, Bank Holidays) and can be discussed.